Acupuncture is traditionally done with needles. Laser Acupuncture is a modern method that uses the same principles of stimulating the body’s healing potential, but without the discomfort of needles. Laser supplies energy to the body in the form of thermal photons of light. During each painless treatment, laser energy increases circulation, drawing water, oxygen, and nutrients to the damaged area. This creates an optimal healing environment that reduces inflammation, swelling, muscle spasms, stiffness and pain. Laser treatment is extremely safe, painless and has no side effects. WHAT TO EXPECT DURING A LASER ACUPUNCTURE SESSION? For most people, laser acupuncture is quite passive. There are no creams, gels or ointments that need to be applied prior to treatment. No pulsating shocks are felt as in forms of electric stimulation. 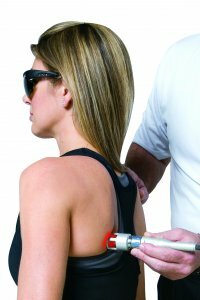 The most notable sensation is the pressure of the probe head of the laser as it comes in contact with the skin and the occasional warm sensation or tingling. Areas of pain or inflammation may be sensitive briefly before pain reduction. Some patients (4-6% of those undergoing laser acupuncture) have reported a slight tingling or tapping in a nerve or along a nerve pathway. Some have noted that they are able to sense a slight feeling of warmth. But for the most part, the treatment, which may last from 5 to 10 minutes, is not noticed at all. Yes! Laser Acupuncture is often used with other forms of therapy, including physical therapy, chiropractic adjustments, massage, soft tissue mobilization, electrotherapy and even following surgery. Other healing modalities are complementary and can be used with laser to increase the effectiveness of the treatment. WHAT IS THE SCIENCE BEHIND LASER ACUPUNCTURE? Class IV-level lasers (see www.klasers.com) supply energy to the body in the form of thermal photons of light. Light is transmitted through the skin’s layers (the dermis, epidermis and the subcutaneous tissue or tissue fat under the skin) at all wavelengths in the visible range. However, light waves in the near infrared ranges penetrate the deepest of all light waves in the visible spectrum. When Class IV level laser waves penetrate deeply into the skin, they optimize the immune responses of your blood. This has both anti-inflammatory and immuno-suppressive effects. It is a scientific fact that light transmitted to the blood in this way has positive effective through-out the whole body, supplying vital oxygen and energy to every cell. Almost everyone knows that vitamin D is called “the sunshine vitamin.” We all know the difference between a suntan and a sunburn. The light from the laser, however, is absorbed by special cellular components or modulates biochemical activity within the body to produce its beneficial effects. In much the same way that plants in photosynthesis use light, humans and animals also have the ability to take advantage of the healthful effects that light has to offer. Laser Acupuncture: $60 per treatment or $240 for 5 prepaid treatments.